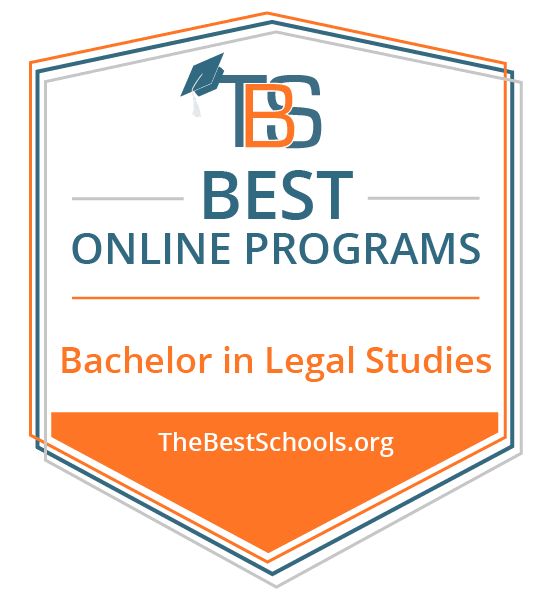 A Bachelor’s in Legal Studies degree online meets the unique personal and professional interests of individuals interested in pursuing legal career paths. Whether an individual wants to be a law enforcement officer, an FBI agent, a paralegal, a court clerk, a lawyer, a judge, or any other of the numerous professions in the legal field, a legal studies major can put students on the path toward professional success. For entry-level professions or future graduate study, many legal professionals start with a Bachelor in Legal Studies degree online. What is a Bachelor's in Legal Studies Degree and How long does it take to complete? What can you do with a degree in Legal Studies? What types of jobs can I do with a degree in Legal Studies? How much does someone make with a degree in Legal Studies? We selected the online legal studies degree programs based on the quality of the program, the types of courses offered, the faculty, rankings, awards, and reputation. Universit.y of Pittsburgh ranks #1 on The Best Bachelor's in Legal Studies Degree Programs! With more than 50 years of experience, the College of General Studies at the University of Pittsburgh offers a liberal arts undergraduate education across numerous fields, including Humanities, Health Services, Legal Studies, and more. With programs built on flexibility, specialization, and interdisciplinary discourse, the College of General Studies helps students prepare to succeed in diverse fields and careers. Students benefit from numerous resources, including career development services, student organizations, internships, and scholarship opportunities. The College of General Studies' Bachelor of Arts in Legal Studies degree program prepares students to pursue a variety of careers in law, as well as future graduate studies. Requiring only two core courses, the program allows students to specialize their studies through 24 credit hours of elective coursework covering diverse, niche areas of the legal field. The program develops a strong foundation of knowledge in the field, blending a specialized focus with an interdisciplinary approach that incorporates law, sociology, political science, and more. Students enhance their ability to think critically and utilize multiple perspectives in solving issues in the field. Students in the online legal studies degree program may complete an internship or independent study project. The University of Pittsburgh is accredited by the Middle States Commission on Higher Education (MSCHE). University California, Berkeley ranks #2 on The Best Bachelor's in Legal Studies Degree Programs! The College of Letters and Science at the University of California, Berkeley, provides a wide variety of undergraduate and graduate program options across numerous departments representing diverse fields. The College of Letters and Science builds on a long tradition of liberal arts education. Students benefit from exposure to faculty actively engaged in research in numerous fields, interdisciplinary approaches, internship and scholarship opportunities, research centers, and more. The College of Letters and Science, in collaboration with the School of Law, offers a Bachelor of Arts in Legal Studies degree program, which prepares students to pursue a variety of professions in the legal field. Building on a liberal arts foundation, students develop a wide knowledge base that emphasizes critical thinking and analysis, and cultural and historical understanding. The program utilizes multiple perspectives. Students engage with fundamental aspects of the field, including law and policy, punishment and culture, legal research and writing, and more. The flexible program provides students with options to pursue specific interests in the field. Students may also complete a capstone project or internship. The University California, Berkeley, is accredited by the WASC Senior College and University Commission (WSCUC). Northwestern University ranks #3 on The Best Bachelor's in Legal Studies Degree Programs! The Weinberg College of Arts and Sciences at Northwestern University provides students with a variety of undergraduate and graduate program options through numerous departments in diverse fields, including the Center for Legal Studies. Founded in 1851, the College boasts over a century and a half of experience in education. Students benefit from a long educational tradition, research-and-publishing faculty, numerous internship and scholarship opportunities, career development services, and more. The Center for Legal Studies offers a Bachelor of Legal Studies degree program with standalone major or adjunct major options for completion. In addition to core coursework, the curriculum offers unique options for specialization through electives in five areas: theory and philosophy; global and comparative perspectives; institutions, organizations, and economics; law and inequality; and legal argument and communications. Students prepare to pursue a variety of legal professions, as well as future graduate study. Students must complete a thesis project. The adjunct major option allows students to pursue Legal Studies alongside another major. Northwestern University is accredited by the Higher Learning Commission (HLC). University of Wisconsin-Madison ranks #4 on The Best Bachelor's in Legal Studies Degree Programs! The College of Letters and Science at the University of Wisconsin-Madison offers numerous undergraduate programs across departments representing a diverse array of fields, including the Center for Law, Society, and Justice. The College of Letters and Science emphasizes a strong liberal arts background. Students benefit from access to internship, study abroad, and scholarship programs, as well as student organizations and career development services. The Center for Law, Society, and Justice offers a Bachelor of Science or Bachelor of Arts in Legal Studies degree program, which prepares students to pursue a variety of careers in the legal field, as well as future graduate study. The program features a curriculum designed around five central themes: legal institutions; processes of legal order and disorder; law and social forces; law and culture; and law and theory. Students may choose to customize their educational experience through emphasizing some themes over others. The program develops a strong, balanced foundation in key aspects of legal professions, including general knowledge of different types of law, legal research and writing, litigation, contracts, law history, and more. The BA and BS programs require 120 credit hours core coursework that represents the five central themes of the programs. These specific courses can vary based on the choices of the individual student and their adviser. Students in the legal studies degree online programs must also complete a senior thesis, or additional coursework. The University of Wisconsin, Madison is accredited by the Higher Learning Commission (HLC). St. John's University ranks #5 on The Best Bachelor's in Legal Studies Degree Programs! The College of Professional Studies at St. John's University provides a variety of undergraduate and graduate options for career-minded students. The College features programs in diverse fields represented by eight departments, including the Department of Criminal Justice, Legal Studies, and Homeland Security. Students benefit from access to career development services, internship and scholarship opportunities, professional development services, student organizations, and more. The Department of Criminal Justice, Legal Studies, and Homeland Security's Bachelor of Science in Legal Studies degree program has approval from the American Bar Association (ABA). The program develops the skills and knowledge necessary for students to pursue paralegal careers in a variety of professional settings, as well as future graduate studies. The curriculum emphasizes key aspects of the field, including critical thinking, research and writing, practical skills, substantive knowledge of law and procedure, and more. Students in the online legal studies degree program may complete independent study or internship opportunities. Students in the program benefit from access to several relevant student organizations, including Alpha Phi Sigma, Phi Alpha Delta, Lambda Epsilon Chi, the Legal Society, and the Mock Trial Team. St. John's University is accredited by the Middle States Commission on Higher Education (MSCHE). Ball State University ranks #6 on The Best Bachelor's in Legal Studies Degree Programs! The College of Sciences and Humanities at Ball State University provides a variety of undergraduate and graduate programs of study across departments, which represent a diverse selection of fields, including Chemistry, Sociology, and Political Science. Utilizing an integrated curriculum, the College provides students with a well-rounded education and a wide knowledge base that draws on hard sciences, social sciences, and humanities fields. Students benefit from access to internship and scholarship opportunities, professional development services, and more. The Department of Political Science's Bachelor in Legal Studies degree program features approval from the American Bar Association (ABA). The program offers two options for completion: Business and Public Law. Students prepare to pursue careers as paralegals in a variety of professional settings, or to pursue future graduate study. The program utilizes a hands-on approach to developing the theoretical and practical skills and knowledge necessary to success in the field. Students in the program must complete a professional or practical experience. Ball State University is accredited by the Higher Learning Commission (HLC). University of La Verne ranks #7 on The Best Bachelor's in Legal Studies Degree Programs! The College of Arts and Sciences at the University of La Verne offers undergraduate and graduate programs across numerous departments representing diverse fields, including English, Biology, History, and Legal Studies. Dedicated to providing students with the knowledge and skills necessary to meet the unique challenges of the twenty-first century workplace, the College of Arts and Sciences provides numerous engagement events, internship and scholarship opportunities, and professional development resources. The Department of Legal Studies offers a Bachelor of Science in Legal Studies degree program that has approval from the American Bar Association (ABA). Students prepare to pursue careers in a variety of legal professional settings as paralegals, legal assistants, and more, as well as to pursue future graduate study. The program utilizes a hands-on approach that emphasizes experiential learning and dedicated independent research. Students develop a strong foundation in the theory and practice of legal professions. The curriculum covers key aspects of the field, including ethics, legal research and writing, contracts, and more. Students must complete an internship and a senior project. The University of La Verne is accredited by the WASC Senior College and University Commission (WSCUC). Webster University ranks #8 on The Best Bachelor's in Legal Studies Degree Programs! The College of Arts and Sciences at Webster University provides students with a variety of undergraduate and graduate program options across diverse departments, including Biological Sciences, English, and Legal Studies. With internship and scholarship opportunities, as well as student organizations, research centers, and annual events (such as the WILLOW project), students benefit from access to unique opportunities for growth and advancement. The Department of Legal Studies' Bachelor of Arts in Legal Studies degree has approval from the American Bar Association (ABA). Students prepare to enter the legal profession in careers as paralegals or other positions, as well as to pursue future graduate study. The program develops the skills and ethical framework necessary to professionals in the field, with a broad foundation of knowledge. Students engage in a curriculum that covers key aspects of the field, including litigation, various types of law, legal research and writing, and more. Gannon University ranks #9 on The Best Bachelor's in Legal Studies Degree Programs! Offering a diverse selection of undergraduate, graduate, and professional programs, both on-campus and online, the School of Humanities and Social Sciences meets the needs of many different students. The School---which is a part of the College of Humanities, Education, and Social Sciences---utilizes a liberal arts core. The School prepares students to pursue many different careers and fields through a balanced, critical, and cultural approach to study and development. The School of Humanities and Social Sciences' Bachelor of Arts in Legal Studies degree program has approval from the American Bar Association (ABA). The program provides a liberal arts background, in addition to developing a strong foundation in paralegal theory and practice. The program utilizes a hands-on approach to develop key knowledge and skills, including legal research and writing, trial preparation and procedure, ethics and critical thinking, and more. Students prepare to pursue careers as paralegals in a variety of professional settings, as well as future graduate study. Students in the legal studies degree online program must complete an internship. Gannon University also offers a 3+3 accelerated program in collaboration with Duquesne University Law School. Gannon University is accredited by the Middle States Commission on Higher Education (MSCHE). University of Central Florida ranks #10 on The Best Bachelor's in Legal Studies Degree Programs! Housed in the College of Health and Public Affairs at the University of Central Florida, the Department of Legal Studies provides a select variety of program options to study law, with plenty of room for specialization. Offering numerous internship and study abroad opportunities, as well as mock trial tournaments, the Department aids students in professional development and advancement. Students benefit from access to faculty actively engaged in research, as well as the Center for Law and Policy. The Department of Legal Studies offers a Bachelor of Arts or Bachelor of Science in Legal Studies degree program with eight options for specialization: Law and Society; Litigation and Advocacy; Public Law; Sports and Entertainment Law; Criminal Law and Individual Liberties; Estates and Property Law; Comparative Law; and Commercial and Transactional Law. With numerous specialization options, students have the opportunity to pursue a diverse array of general and niche careers in law, meeting many different interests. Regardless of the path chosen, students develop a strong foundation in law and legal practice which balances legal theory with hands-on experience. Students in the online legal studies degree program must also complete a capstone project. Students may complete an internship, as well. The Department of Legal Studies also offers a 3+3 accelerated law program. The University of Central Florida is accredited by the Southern Association of Colleges and Schools Commission on Colleges (SACSCOC). University of Alaska Anchorage ranks among the top 20 on The Best Bachelor's in Legal Studies Degree Programs! Providing a variety of undergraduate and professional program options in law and justice, the UAA Justice Center at the University of Alaska Anchorage prepares students to pursue careers or future graduate study in law. Established in 1975 by the Alaska legislature, the UAA Justice Center advances the field through education, faculty research and publication, outreach through the Alaska Justice Forum, and several research centers, including the Alaska Justice Information Center. The UAA Justice Center's Bachelor of Arts in Legal Studies degree program features approval from the American Bar Association (ABA). The program provides a balanced foundation of knowledge and skills for a variety of legal professions. The curriculum emphasizes fundamental knowledge through theoretical and practical approaches, including American law and policy, various types of law, ethics and legal professionalism, civil procedure, and more. Students prepare to pursue a variety of careers in the field, including paralegal careers, law enforcement, and government, as well as future graduate study in law. Students in the Bachelor of Arts in Legal Studies program may also complete an internship. The University of Alaska Anchorage is accredited by the Northwest Commission on Colleges and Universities (NWCCU). Morehead State University ranks among the top 20 on The Best Bachelor's in Legal Studies Degree Programs! The Department of History, Philosophy, Politics, International Studies, and Legal Studies at Morehead State University offers students a diverse selection of undergraduate and graduate study options. Located in the Caudill College of Arts, Humanities, and Social Sciences, the Department offers students access to internship, study abroad, and scholarship opportunities. The Department also houses numerous student organizations and clubs, including Alpha Lambda Pi. The Department of History, Philosophy, Politics, International Studies, and Legal Studies offers a Bachelor of Arts in Legal Studies degree program, which features approval from the American Bar Association (ABA). The program develops the knowledge and skills necessary for students to pursue careers as paralegals in a variety of professional settings. Students engage in coursework that covers fundamental aspects of the field, including law and ethics, legal research and writing, trial practice, procedure, and more. Students gain valuable hands-on experience through participation in community projects and outreach programs, including a variety of clinics and mock trials. Students must also complete an internship. Morehead State University is accredited by the Southern Association of Colleges and Schools Commission on Colleges (SACSCOC). Washburn University ranks among the top 20 on The Best Bachelor's in Legal Studies Degree Programs! Offering a variety of undergraduate and graduate program options, the Department of Criminal Justice at Washburn University meets the needs of a diverse body of students interested in pursuing careers in law and law enforcement. Housed in the School of Applied Studies, the Department provides access to useful School resources, including student organizations and honors programs. The Department also provides internship and scholarship opportunities. The Department of Criminal Justice and Legal Studies' Bachelor of Legal Studies degree program utilizes a hands-on approach to the study of law. Through coursework, a capstone project, and an internship experience, students develop a balanced foundation of theoretical and practical knowledge. The program develops competency in key areas, including legal writing and research, interviewing and investigation, ethics, office management, and more. Students prepare to pursue careers as paralegals as well as future graduate study. Students must also complete an internship and capstone project. Washburn University is accredited by the Higher Learning Commission (HLC). Champlain College ranks among the top 20 on The Best Bachelor's in Legal Studies Degree Programs! One of four major components of Champlain College, the Division of Education and Human Services provides students with a variety of undergraduate, graduate, and professional options for study. With unique, career-focused curricula, professional partnerships, and numerous field opportunities, the Division of Education and Human Studies maintains a commitment to the academic and professional success of its students. The Division of Education and Human Studies' Bachelor of Arts in Law degree program has approval from the American Bar Association (ABA). The program develops a strong foundation in legal practice and theory. The curriculum includes fundamental aspects of law and legal practice, such as ethics and critical thinking, American government and law, various types of law, procedures and torts, legal research and writing, and more. Through an “upside-down curriculum,” students engage in law coursework in their freshman year, providing a sustained focus on the major throughout the program. Students develop the knowledge and skills necessary to pursue a variety of legal careers. Students in the legal studies degree online program must complete a capstone project. Students may also complete an internship or study abroad experience. Champlain College engages in a partnership program with New York Law School, providing unique study opportunities to students. Champlain College is accredited by the New England Association of Schools and Colleges (NEASC). Dominican University ranks among the top 20 on The Best Bachelor's in Legal Studies Degree Programs! Dedicated to meeting the needs of busy adult students, the School of Professional and Continuing Studies at Dominican University provides a variety of undergraduate, graduate, and professional program options. The School focuses on the development of key professional knowledge to provide adult learners with the resources and opportunities necessary to pursue or advance careers through higher education, with internship opportunities, careers services, and professionally minded curricula in its programs. The School of Professional and Continuing Studies offers a Bachelor of Arts in Legal Studies degree program with seven options for concentration: Criminal Justice; Disability Advocacy; Labor Relations; Law and Social Justice; Paralegal Studies; Public Administration; and Sustainability Studies. The program develops a strong foundation of knowledge and skills that are key to legal studies and practice and built on a liberal arts core. Students engage in a curriculum that covers theories of law, the American Legal system, religion and law, philosophy and law, ethics, and more. Through gaining general and specialized knowledge, students prepare to pursue a diverse array of legal careers, as well as professional certification, and future graduate study. Students may also complete an internship. In addition, the School of Professional and Continuing Studies offers an accelerated program that combines the Bachelor of Arts in Legal Studies with a Master of Library and Information Science. Dominican University is accredited by the Higher Learning Commission (HLC). University of Illinois Springfield ranks among the top 20 on The Best Bachelor's in Legal Studies Degree Programs! Providing undergraduate and graduate degree options, the Department of Legal Studies at the University of Illinois Springfield seeks to develop the next generation of qualified legal professionals. Drawing on the resources of the College of Public Affairs and Administration, the Department offers opportunities for advancement through internships, the Pre-Law Center, the Mock Trial Club, and more. The Department of Legal Studies' Bachelor of Arts in Legal Studies degree prepares students to pursue a variety of careers in law, government, politics, law enforcement, lobbying, and more. The program engages students in key aspects of legal studies, including law in society, the history of American law, legal research and writing, and constitutional law. The program provides a strong foundation in legal knowledge, an interdisciplinary, liberal arts background, a contextual understanding of law, and strong analytical skills. Students also prepare to pursue future graduate study. Depending on coursework completed and GPA, students may earn a Legal Assistant Certificate after graduation. The University of Illinois Springfield is accredited by the Higher Learning Commission (HLC). Nova Southeastern University ranks among the top 20 on The Best Bachelor's in Legal Studies Degree Programs! The Department of History and Political Science at Nova Southeastern University provides students with a diverse selection of undergraduate and graduate programs of study, as well as minor options for specialization. Part of the College of Arts, Humanities, and Social Sciences, the Department provides access to unique resources, such as the Mock Trial Team, a pre-law chapter of Phi Alpha Delta, study abroad and internship opportunities, and more. The Department of History and Political Science offers a Bachelor of Science in Legal Studies degree program, which prepares students for future study of law at the graduate level, as well as incorporating a legal perspective into other disciplines. Students develop a strong foundation in legal theory and practice through coursework that covers the history of law, legal research and advocacy, American government and politics, and more. The Bachelor in Legal Studies degree program requires students to take nine credits of philosophy coursework, developing a strong theoretical and critical thinking background. Students enhance their ability to evaluate oral and written legal arguments, analyze legal and political contexts, explain the historical development of legal systems, and address the philosophy behind law. Students in the legal studies degree program may also complete an internship. Nova Southeastern University is accredited by the Southern Association of Colleges and Schools Commission on Colleges (SACSCOC). University of Southern Mississippi ranks among the top 20 on The Best Bachelor's in Legal Studies Degree Programs! Offering a variety of undergraduate and graduate program options in several related fields, the Department of Political Science, International Development, and International Affairs at the University of Southern Mississippi provides students with numerous opportunities to pursue political and legal careers. Through a variety of student organizations, career development services, assistantships, and internship opportunities, the Department aids students in personal and professional development. The Department of Political Science, International Development, and International Affairs offers a Bachelor of Arts in Legal Studies degree program with a general track or a pre-law track option. The program develops a balanced foundation of skills and knowledge necessary to success in the legal field. Students engage in a curriculum that covers key areas, including legal research and writing, ethics and critical thinking, various forms of law, and law office management. Students prepare for careers as paralegals, as well as for future graduate study in law. The University of Southern Mississippi is accredited by the Southern Association of Colleges and Schools Commission on Colleges (SACSCOC). Wilmington University ranks among the top 20 on The Best Bachelor's in Legal Studies Degree Programs! With a variety of undergraduate and graduate program options, students in the College of Social and Behavioral Sciences at Wilmington University may pursue their interests in numerous, diverse fields. The College builds its programs on values of personal worth, human dignity, social justice, integrity, intellectual curiosity, and academic freedom. With a dedication to developing the next generation of professionals in various fields, the College of Social and Behavioral Sciences promotes career-readiness and professionalism. The College offers co-op and internship opportunities for serious students. The College of Social and Behavioral Sciences offers a Bachelor of Science in Legal Studies degree program approved by the American Bar Association (ABA). The program develops a strong foundation of knowledge and skills necessary to the field. Students engage in a balanced curriculum that covers practical and theoretical areas, including ethics and critical thinking, legal research and writing, civil procedure, interviewing, and more. The program offers a diverse array of elective coursework for students to pursue niche interests. Students prepare to pursue a variety of legal careers, including paralegal and law enforcement. University of Maryland University College ranks among the top 20 on The Best Bachelor's in Legal Studies Degree Programs! The Undergraduate School at the University of Maryland University College offers students a wide variety of undergraduate degree and non-degree options for study. Specializing in online and hybrid programs, the School provides non-traditional students with flexible options to pursue higher education and professional advancement on campus or online. Military and veteran students may receive valuable discounts and financial aid. The Undergraduate School offers a Bachelor of Science in Legal Studies degree program, which prepares students to pursue a variety of careers in the legal field, as well as continued graduate study in law school. The program develops a strong foundation of knowledge and skills in fundamental areas. Students engage in coursework that covers legal research and writing, critical thinking and ethical decision-making, gathering and applying evidence, and more. Students develop key competencies necessary to success in the field as paralegals, legal assistants, and more. Students may complete a capstone project or internship. Students in the legal studies degree online program may engage in the school chapter of Lambda Epsilon Chi, the national honor society for legal studies founded by the American Association for Paralegal Education (AAfPE). The University of Maryland University College is accredited by the Middle States Commission on Higher Education (MSCHE). University of West Florida ranks among the top 25 on The Best Bachelor's in Legal Studies Degree Programs! With a handful of undergraduate and graduate programs, the Department of Legal Studies, Public Administration, and Sport Management at the University of West Florida provides students with diverse options to pursue academic and professional paths. As part of the College of Education and Professional Studies, the Department provides access to College resources for students, as well as community engagement opportunities through outreach programs. The Department of Legal Studies, Public Administration, and Sport Management's Bachelor of Arts in Legal Studies degree program develops a strong foundation in key aspects of law and related fields. The program develops the theoretical and practical knowledge and skills necessary to succeed in a variety of professions. The curriculum covers key aspects of legal studies, including various types of law, the role of law in society, ethics, legal research and writing, advocacy, and more. Students enhance their ability to act as effective professionals in various fields, including as paralegals and in law enforcement. Students in the legal studies degree online program may also complete an internship or field study experience. The University of West Florida is accredited by the Southern Association of Colleges and Schools Commission on Colleges (SACSCOC). Florida Gulf Coast University ranks among the top 25 on The Best Bachelor's in Legal Studies Degree Programs! The Department of Justice Studies at Florida Gulf Coast University provides students with undergraduate and graduate options for study in several justice fields. Housed in the College of Arts and Sciences, the Department offers students access to careers services, internship opportunities, and research centers, including the Institute for Youth and Justice Studies. The Department of Justice Studies' Bachelor of Science in Legal Studies degree program prepares students for a variety of professional certification exams in the paralegal field, including the CLA, PACE, and NFPA exams. Students engage in a balanced curriculum that establishes a strong foundation of knowledge and skills necessary to careers in the legal field. The Bachelor's in Legal Studies program develops competencies in areas such as legal research and writing, understanding of various areas of law, professional ethics, criminal procedure, and more. Students prepare to pursue both a variety of careers, including as paralegals or legal assistants, as well as future graduate study. Florida Gulf Coast University is accredited by the Southern Association of Colleges and Schools Commission on Colleges (SACSCOC). Stevenson University ranks among the top 25 on The Best Bachelor's in Legal Studies Degree Programs! With eight undergraduate degree programs, the School of Humanities and Social Sciences at Stevenson University offers students a wide selection of opportunities for study in diverse fields, including Legal Studies, English, Theatre and Media Performance, and Psychology. Students benefit from practical and hands-on approaches to education, career preparation services, and engagement with faculty from diverse fields. The School of Humanities and Social Sciences' Bachelor of Science in Legal Studies degree prepares students to pursue a variety of careers in law. The program provides specific emphasis on the skills and knowledge necessary for success in the paralegal field, covering such fundamental topics as various types of law, legal writing and research, investigating cases, interviewing, litigation, and more. Students enhance their ability to engage in roles as effective parts of a legal team. Students may pursue an internship option or a pre-law option. Students in the online legal studies degree program must also complete an internship and a capstone project. Stevenson University is accredited by the Middle States Commission on Higher Education (MSCHE). West Virginia University at Parkersburg ranks among the top 25 on The Best Bachelor's in Legal Studies Degree Programs! One of six divisions that make up West Virginia University at Parkersburg, the Business, Accounting, and Public Service Division provides students with a variety of undergraduate degree and non-degree options across several fields. With a dedication to excellence and career development, the Division provides career-focused educations, as well as career services, to help students secure jobs and succeed in numerous professions. The Business, Accounting, and Public Service Division's Bachelor of Applied Science in Legal Studies degree prepares students to pursue a variety of careers in law and related fields, as well as to pursue graduate study. Students engage in a balanced curriculum that covers theoretical and practical aspects of legal careers, including legal research and writing, ethics, and civil procedures, as well as office management and professional development. The program provides an internship option for students to develop on-the-job experience. Students must complete a capstone project, and may complete an internship. West Virginia University at Parkersburg is accredited by the Higher Learning Commission (HLC). Post University ranks among the top 25 on The Best Bachelor's in Legal Studies Degree Programs! One of three schools comprising Post University, the John P. Burke School of Public Service and Education provides a variety of undergraduate and graduate program options for students who seek to engage in their communities professionally. Dedicated to the goal of changing lives and transforming communities, the School prepares students with a focus on practical application and career-readiness. The Burke School of Public Service and Education's Bachelor of Science in Legal Studies degree program prepares students to pursue a variety of careers in law and related fields. Students engage in a balanced curriculum that promotes a comprehensive understanding of the law, legal practice, and legal services, and develops researching and writing abilities, as well as ethics. Students enhance their ability to effectively fill roles in law enforcement, legal practices, and other areas, as well as to pursue further study. Students in the online legal studies degree program may complete an internship. Post University is accredited by the New England Association of Schools and Colleges (NEASC). The degree programs address the organization, process, and function of institutions as they relate to the legal system. Some of the programs cover how laws relate to politics and economics, while some of them emphasize legal research and writing. A legal studies major provides students with the knowledge and skills necessary to enter a variety of professions in the legal field, as well as pursue future graduate study in various disciplines. Bachelor's in Legal Studies degree programs develop foundational knowledge of law and legal procedures, with students engaging in fundamental aspects of the field, including knowledge of various forms of law, court proceedings, trial preparation, legal research and writing, investigation, and more. Many of the Bachelor's in Legal Studies programs utilize unique approaches that set them apart from others. Bachelor of Arts programs typically incorporate an interdisciplinary, liberal arts foundation that emphasizes a theoretical, cultural understanding of law in society. On the other hand, Bachelor of Science programs typically incorporate a more technical and practical approach, focused on the specific workings of legal careers. While some programs prepare students for legal careers in a general sense, others focus on specific career paths, such as the paralegal profession. Typically, it takes students four years to complete the online legal studies degree program. What can you do with a Bachelor's in Legal Studies Degree? A Bachelor's in Legal Studies degree opens up diverse opportunities for students. Individuals who major in legal studies can pursue numerous careers in law and related fields. Some programs provide more specialized, career-specific approaches than others. Additionally, many individuals who hold a Bachelor's in Legal Studies degree may choose to pursue further study in numerous areas in graduate school, including criminal justice, public policy, and law. Graduate study further increases the careers opportunities associated with a legal studies major. With a wide variety of career paths, legal studies degree holders also enjoy a spectrum of potential salaries. The following information reflects annual median salary for several jobs in 2016, retrieved from the Bureau of Labor Statistics (bls.org, 2017).